With top tier supercross and motocross stars like Chad Reed (CBDmd) and Dean Wilson (Ignite CBD) both signing on to promote CBD companies, whether or not they can talk about their sponsors on TV or display signage at the races to promote their sponsors has been a hot topic in 2019. Despite the federal Farm Bill—making CBD federally legal—becoming law, some states have still not made it legal. With that, FELD and NBC Sports took a hard stance against the riders talking about CBD or showing any signage. Any and all signage and talking about the companies is basically banned from Monster Energy Supercross in ’19 and the riders were told that there would be some very harsh consequences if they violated that ban. The letters CBD are not allowed anywhere near Supercross. Listen to how Chad Reed worked around the CBD ban during his NBC Sports post-race podium interview at the 2019 Detroit SX below. NBC Sports is the broadcasting company for both motocross and supercross, so it is no surprise that the same ban for in-broadcast promotions of CBD would carry over to the 2019 Lucas Oil Pro Motocross Championship, but MXSports is loosening their regulations quite a bit for any and all off-air promotions of CBD. Like for SX, riders are not allowed to display any signage on their bikes or person and they are not allowed to talk about their CBD sponsorships in any NBC Sports in-broadcast interviews. Unlike SX, riders and teams are permitted to display signage in the pits, on their team rigs and riders are permitted to talk about their CBD sponsorship in any off-air interviews. Dean Wilson’s Instagram promo for his Ignite CBD sponsorship. This is a huge step in the right direction for a sport that struggles to bring in sponsorship from companies outside the industry. The ever-evolving cannabis industry has billions of dollars and with motocross and supercross being perfect for their target market, I will not be surprised if they begin encroaching on the energy drinks in the future. 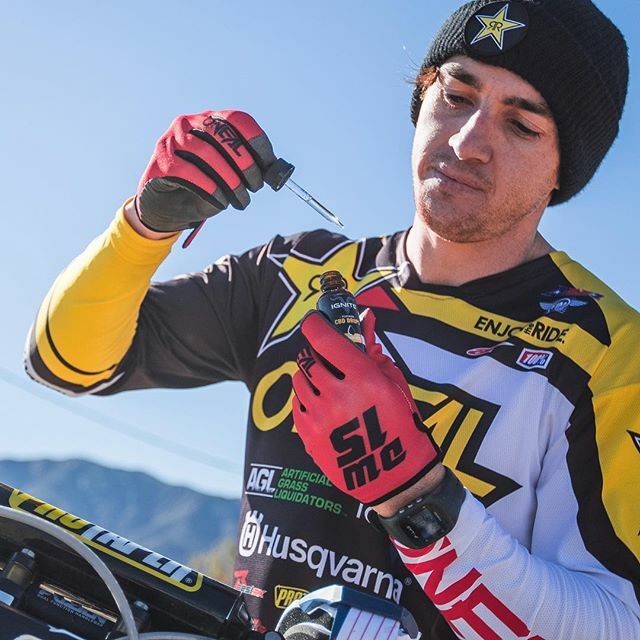 Riders and teams are responsible for seeking their own legal counsel with regard to their association with CBD products and promotions, and MX Sports Pro Racing makes no legal representations with regard to the legality of same.